What is an Alabama Last Will and Testament? 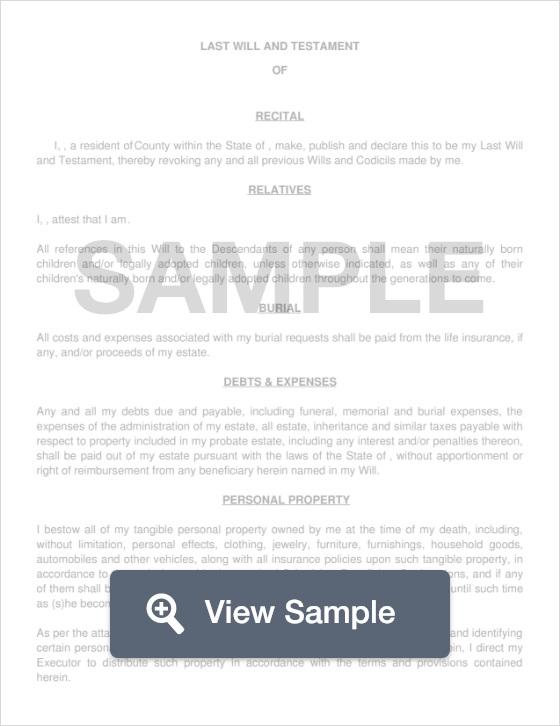 Alabama Last Will and Testament: What Is It? Each state has its own set of laws, definitions, and signing requirements that relate to last will and testament documents. Below, these specifics are defined for the state of Alabama. Witnesses - According to §43-8-131, the document must be signed by two (2) individuals who are not recognized in the Will. Step 1 - Using the provided FormSwift Template, enter the name of the Grantor, followed by his or her identified gender. If the Grantor is single, proceed to the next step. If married, divorced, widowed, separated or engaged, enter the name of the person, and designate whether or not this person is to be named as a beneficiary. Step 4 - Specify if the Grantor has any children, along with pets, property, or life insurance. Step 5 - Describe the names of the children, whether they are deceased or living, and whether or not they will be named as beneficiaries. In addition list the names of pets, and information about any life insurance. Step 6 - If the Grantor has any children, specify which property he or she would like to leave each child, as well as the percentage of property to be inherited. Step 7 - Indicate whether or not the Grantor wishes to set up a trust for a person who is disabled or mentally ill. Setting up a trust for a person with special needs or someone who requires special care can prevent any interference with their ability to receive Supplemental Security Income and Medicaid benefits. Step 8 - Specify the age that children must be in order to start receiving benefits from the trust, as well as the portion that will be received. Lastly, enter what age the beneficiary will be when the benefits are terminated. Step 11 - Naming an Executor - An Executor is a person charged with administering the Grantor’s estate once he or she passes away. This person can be a beneficiary in the Will, or a trusted person such as an attorney or good friend. If an Executioner is not named in a Will, the court will appoint one. If the Grantor has an appointed Executioner, provide the following information. Additionally, state whether or not the Grantor would like to appoint an alternate Executioner. If so, state his or her name and your relationship with them. Lastly, if there is someone the Grantor does not want to act as Executioner under any circumstances. If so, state their name, and relationship with the Grantor. Step 12 - Appointing a Trustee - If the Grantor’s assets are already in a trust, he or she must appoint a Trustee who will be responsible for distributing the assets out of the trust. Step 15 - Guardian for Minor Children - If the Grantor wishes to appoint a guardian for his or her minor children, provide the following information of the appointed guardian, followed by the name of any conservator. Remember that in order for this document to be legal, it must be signed by all parties, including two (2) witnesses. In addition, the document must be notarized by a notary public.